It's going to be June pretty soon, so I decided to change the template to look more suitable for the "rainy season." I could have done it in June, but well, it's better that I do it when I have time and feel like doing it. Rented a video called “Crust.” A British comedy -- stupid, nonsense, laughable and yet heart-warming, non-Hollywood B-film. Believe it or not, I liked it. It was like a pleasant surprise. It’s a movie that tells you how wonderful a hug is. On Saturday (21st) and Sunday (22nd), I visited Kansai to see my friends there and try something that I’d always wanted to. In the past, ferry boat was usually my first choice of transportation when going to Osaka. I thought it was the least expensive and most convenient choice. A couple of years ago, however, I noticed that the express bus costs the same and gives me more choice of arrival time in Osaka. The ferry boat arrives too early in the morning, like 6:30am, and I didn’t know what to do until most stores open at around 10:00am. This time, I took an express bus and skipped lunch to save money for the dinner with fish fish. She had suggested a pub in Kyoto, the Hub near Keihan Sanjo station. The name of the place sounded familiar to me, probably because I’d seen the pub’s ad in “Kansai Time Out (a local information magazine)” or something. I took Hankyu from Osaka to Kyoto to save money again, and walked from Hankyu Kawaramachi stn. to Keihan Sanjo along the Kamo river. 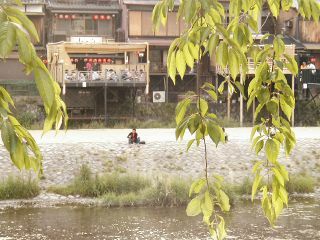 Almost all restaurants along the river had terraces facing the river so that customers can enjoy beer there. I had a nice dinner with fish fish and another blogger, Patrick at the Hub. (Details here.) Then I came back to Umeda by Hankyu again, met my Japanese friend there, and went to our favorite drinking place near Hanky Sanbangai. We had a lot to catch up on. Luckily, I wasn’t too drunk to forget calling a guy in Okayama about my plan on Sunday… yes, my plan of trying something I’d always wanted. The guy said that the weather was going to be OK, and he was looking forward to seeing me. I was so excited! It was drizzling when I woke up. How come?! The weather forecast I checked a few days ago said sunny days for this weekend! How can this happen?! What I was going to try for the first time was learning sports-kite flying. I had seen sports kite flying when I lived in Kansai, and I got fascinated by its move, but never had a chance to learn how to fly it. After coming back to Kochi, my interest in sports kite grew stronger every time I saw the deserted beach in my hometown. I tried to find sports kite flyers in Kochi, but with no success. Then one day I found that there is a sports-kite club in Okayama and they teach kite-flying for free of charge! And the location was where I can drop by on my way back from Osaka by JR. So it was a perfect plan…except the weather. After I called the guy in Okayama and confirmed the cancellation of our meeting, I had to re-schedule everything planned on that day. I ended up spending most of the day shopping in Osaka, but I was so disappointed for the rest of the day. I didn't feel like taking any more pics, except the one of an eki-ben I bought in Okayama. Or I just have to convince myself of that. 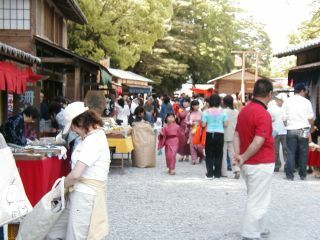 Last Thursday I visited my friend who lives in a small village in this prefecture. 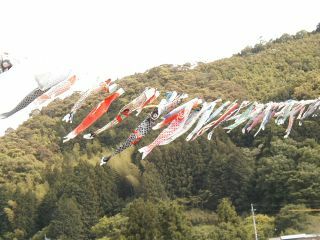 The village is locally famous for putting up many koinobori (carp-shaped streamers) across the river in May every year. I’d always wanted to see the koinobori, and this year I finally had a chance to visit the village. 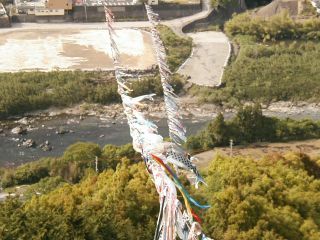 Then she drove me up to the hill-top where we had a nice view of the river, the koinobori and surrounding mountains. It was such a peaceful view of a small, quiet village. 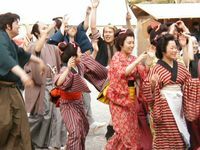 Henpai means “offering someone sake in return” and it’s a custom probably seen in other places in Japan, too, but overly emphasized here in Kochi. This custom obviously started with sake and sakazuki (tiny cup for drinking sake) before beer was introduced into Japan, but now people do it with glasses of beer in this prefecture. When they order bottled beers with small beer glasses, you should know that henpai will be inevitable and be ready. When someone gives you an empty beer glass and pours beer in it, you are supposed to drink it up, return the empty glass to the person and fill it with beer again. That’s the henpai procedure. Pouring beer into someone’s glass is considered as a kindness, so you should return the kindness by doing the same thing back to the person. You see? Well, I admit that this is a way to enhance intimacy and I might even miss it if we abolished this old custom completely, but I can’t say I’m 100% in favor of this henpai custom. You just have to know your limit and use tactics for politely taking an easy way out from henpai rushes. Anyway, I had such a good time there. The memories of the time I spent in that small village with the sound of the river always being in the background will stay in my mind for a long time. 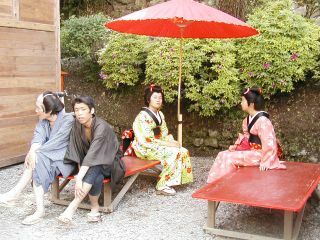 * I heard that in some areas in Kochi, henpai is not so popular any more. So you may or may not witness/experience this custom when you drink in Kochi. It’s OK. If it has to rain, it’s better be today. This weekend is going to be a real eventful one, starting tomorrow afternoon, actually. I’m going to stay at my friend’s house tomorrow night, then going to visit my friends in Osaka, Kyoto, and Okayama on Sat. and Sunday. Wow! Having this weekend plan as a carrot in front of a horse, I’ve been behaving this week….so far. Eating at home as much as possible, living on the leftovers in the fridge, to save money for the weekend. Keeping eyes on weather forecast and doing washing/cleaning. See, I should be rewarded for these good deeds with a nice weather for the weekend. There’s another deed that I’m proud of myself about. Yesterday I re-started something that I haven’t done for more than half a year. I have tried not to face it, kept procrastinating it, telling myself “I’ll do it when the time comes. I know I can.” It’s amazing how time passes so quickly when you procrastinate something in this way… I have felt unhappy all the time, but just couldn’t actively change it. This usually happens every year around May when the weather is so nice and I see flush of greenness everywhere around and feel the whole world being ready for another brand-new start. I feel the urge to get rid of the unnecessary stuff and start a new thing or re-start something that I had started but could not carry on. It has just come to me again this year. There’s one special change that I’m going to make this year. I decided to dig into the pile of old materials/information that I brought back from the U.S. long time ago and throw away most of them. I never needed any of them for the past 10 years or so, especially now that I can get more updated information anytime through the internet, but I just kept them to convince myself that I did work hard once and did something in the past. Well, I guess there is a better way to make myself feel worthwhile. For now, a large empty space on the bookshelf would be more refreshing to my eyes. I’m also going to challenge something that I’ve always wanted to try. I’ll post about it when I actually start it later this month. OK, I know this sounds so stupid and childish, but I just couldn’t stand it today. 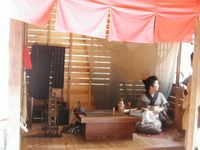 As I wrote in my previous entry, a mini live concert was held today as a part of the “historical fair” at Kochi castle. The performer was my favorite singer who had many hits in the late 70s and early 80s. His coming to this small city and having an admission-free live concert was like a dream to some of Kochi citizens around my age, honestly. This guy really IS somebody --- he had joint concerts with Ray Charles several times in Japan. The mini-concert was only 1-hour long so we, at least I, appreciated every single song. He played my two most favorite songs at the end, which made me almost tearful. Then, the city mayor came on stage, thanked him for the great performance, and asked him to play just one more song… OUR favorite song. I was almost freaking out with joy. I’m sure that everyone there was ready for the singer’s husky voice and willing to give a standing ovation at the end. What happened, however, was that the singer let the mayor sing… just trying to be polite, I suppose… and everyone hoped that the mayor would stop after the first verse, but he sang the whole song! Can you believe it? What would you feel if Eagles came to your town for a free live concert, and the mayor came on stage at the end asking them to play “Hotel California” once again, and sang the whole song instead of Don Henley? A drunk guy went to the stage and gestured to the mayor to quit singing. He was stopped by some guards, but I’m sure everyone was on his side. I WAS. Well, today the mayor lost some votes for the next election for sure. Boy, today was just full of disappointments… this concert and the strawberry tart I made… and it started raining again at night! Oh, wait, there WAS one good thing that happened today. I accidentally found a free software called “PhotoFiltre” on the net and downloaded it. Thanks to that software, I managed to make the background image of these posts out of the photo of young green leaves that I took a few days ago. Not too bad for the first attempt. 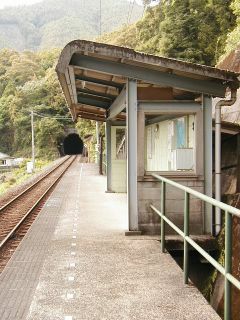 As I wrote several times before, Kochi is a small city on Shikoku island, far away from big cities like Tokyo or Osaka. Life is laid-back here and we residents are a bit backward and old-fashioned. You think that Tom Cruise's friend was the last samurai in Japan? No no, we still have some here. They need to take a break like this between their busy work shifts at the prefectural office. Young girls get together on the street and enjoy chatting. 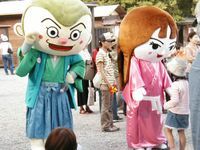 It’s our “historical fair” being held from May 1 to May 5 at Kochi castle (opening ceremony was on April 30th). 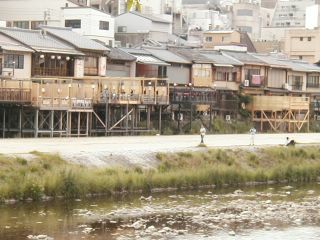 They built small shops/houses that look like those we had about 200 to 400 years ago in Edo period. Yes, those who love Japanese jidaigeki (historical dramas) may understand this: It’s the time when Abarenbo-shogun or Mito-komon were around (???). 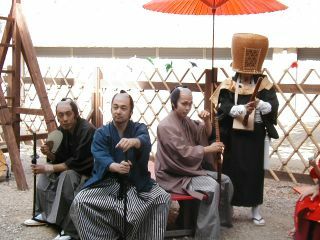 The volunteers recruited dress in the costumes of that time and stay at the venue from 9 to 5 for 5 days, demonstrating the way of life back then. 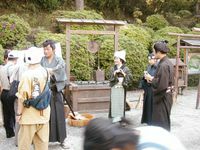 You see a well people used hundreds years ago, and a typical tailor's house of Edo period. Some wanna-be ninjas were practicing throwing shuriken (ninja stars). 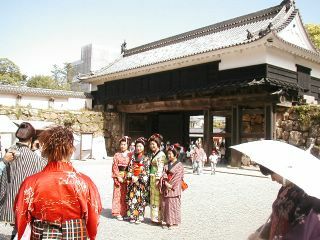 It was funny to see the crowd of those people in historical costumes mixed with tourists in T-shirts and jeans. What’s funnier was seeing the tourists taking photos of those volunteers in costumes taking photos of each other. Well, I did the same, too. 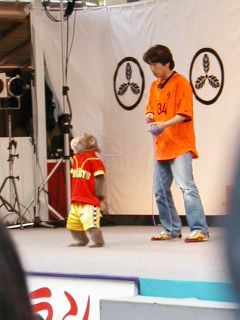 There was also a monkey showman performing on stage. It was pretty funny. "Hey, Are you listening?!" "........"
I'm going to come visit the castle again to see the concert scheduled on the 5th. To be perfectly honest, it’s giving me a bit nasty satisfaction at the moment. We are in what they call “Golden week” here in Japan now, which is a period at the end of April and beginning of May with several national holidays. If you are an office worker and combine your paid leaves with the national holidays and weekends, you can have apx. 10-day vacation this year. Remember, this is Japan. People usually don’t dare to tell their boss that they want 10-day vacation anytime in the year. 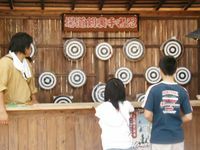 In this “Golden week,” however, the holidays are publicly given to everyone, so all you have to do is just to take a couple of paid holidays. Much less guilt involved. 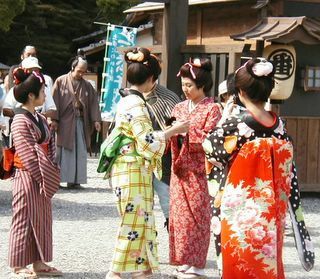 If you work at a restaurant or a hotel or in any kind of sightseeing-related business in Japan, just forget about taking a break in this time of the year. You know what I mean. That applies to Izakaya-pub workers like myself, too. Golden week doesn’t mean a holiday week to us --- it’s a busier week than usual and we have to work just as our regular work shift requires, if not more. It’s funny that even though my work shift doesn’t change in this holiday week, still I feel this week is a special holiday week… Maybe some holiday-special programs on TV and also seeing some stores/offices being closed contribute to this feeling. Somehow I’m feeling more relaxed today than on other regular Sundays. I guess I’m going to work on the template of this blog. Cherry blossom season is over … it’s the season of tender green of new leaves.